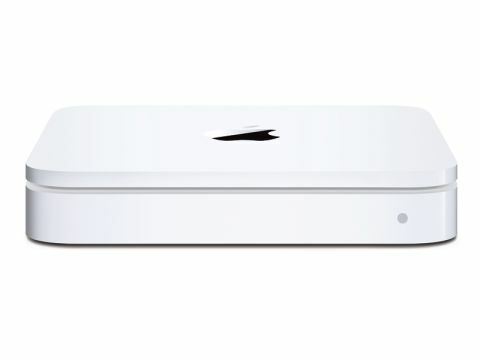 Time Capsule is a hard drive and AirPort Extreme Base Station in one box, functioning as a wireless and Ethernet router as well as a backup device. A recent capacity upgrade now gives you 1TB for £199 (was 500GB), or 2TB for £379 (previously 1TB). It offers three Ethernet LAN and one WAN port for connection to a modem to get online. Most UK users would prefer a built-in ADSL modem, but doing it this way means cable subscribers can use it with the modem supplied by their ISP. It's wireless n compatible and can access the 2.4 and 5GHz wavebands simultaneously, so you can set up a network on the 5GHz band and access it with wireless g devices, which are only capable of connecting on 2.4GHz. But it's as a backup device that Time Capsule really shines. It's easy to configure, and it can back up every computer on your network using Time Machine. After an initial backup Time Machine, keeps hourly incremental backups for the past 24 hours, daily backups for the last month and weekly backups until your disk is full, which takes a long time with 2TB to play with. You can also share an external hard drive or printer with the rest of your network by connecting it to Time Capsule's USB port. As the initial backup has to copy your entire hard drive (and Mac-formatted external drives if applicable), it is likely to take a good few hours. It's best to use an Ethernet connection for this lengthy first step, even if you want to back up wirelessly afterwards. Unfortunately, Apple's otherwise excellent setup assistant won't show you how to do this. Also, data backed up onto Time Capsule is freely available to any computer on the network, not just the machine that was backed up. This lack of security could be problematic even in a home environment. Minor criticisms aside, this is an excellent product. It might sacrifice configurability for simplicity, but that's exactly what many home users want. And with the new capacity upgrade, there's never been a better time to buy a Time Capsule.